There were many things to like about Thor: Ragnarok, and chief among them was the chemistry between unlikely allies Thor and Valkyrie, aka Chris Hemsworth and Tessa Thompson. Well, the duo are reuniting for Men in Black International, a spin-off from the original sharp-suited trilogy that relocates the action to another branch of the MIB, this time in London. The latest iteration, overseen by F Gary Gray (Straight Outta Compton, Fast & Furious 8), sees the UK-based team head off on a globe-trotting mission. Thompson’s Agent M is the new recruit (essentially the equivalent of Will Smith in the original), and Chris Hemsworth is Agent H, the more seasoned recruit that she’s paired with. Whatever happens, expect odd-couple sparks and banter to fly between them. “There’s definitely some yin and yang between the two of them,” adds Hemsworth. 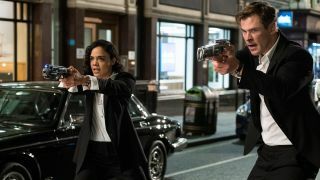 Men in Black: International opens in the UK and US on June 14, 2019, and you can read more about it in the latest issue of Total Film magazine, which hits shelves this Friday, April 5. It’s a huge Avengers: Endgame special, and features loads more including Toy Story 4, Olivia Wilde, Detective Pikachu and Rocketman to name a few. Check it out! If you’re a fan of Total Film, why not subscribe so that you never miss an issue, and you’ll also get exclusive subscriber-only covers delivered directly to your doormat before it hits shelves? What are you waiting for? We’re currently running a subscription offer where you can subscribe from as little as £12.25 to get an Alien Funko Pop! And 50 Greatest Sci-Fi Movies book, worth £20! Or you can upgrade your package to get Alien: Isolation on Xbox or PS4 too. Head to My Favourite Magazines now to take advantage of the offer. (Ts and Cs apply).